Russell was a reminder that the wars against indigenous people, and the conquest of their resources, are far from over, and that we cannot be fully human until remorse with our eyes wide open allows the possibility of reconciliation. Russell Means, who died on Tuesday, kept a place here in Santa Monica in recent years, with his wife, Pearl. Once my wife Barbara and I took our son Liam for a visit to meet this man we described as having fought a real war against the government. Still in good health a couple of years ago, Russell took great interest in our 10-year-old, as he did in all kids trying to understand the actual history of our country. Russell was a strong, imposing figure. It wasn’t only his braided hair or the beads around his neck; his clear eyes gazed as if it was 1873. He had Liam’s attention. When they shook hands, Russell told Liam that his grip needed to be firmer, he should stand up straight, and that he always should look the other person straight in the eye. Our son will not forget the quiet authority this man quietly commanded. Russell had that effect on people, the presence of a nineteenth-century warrior still alive as a force in the here and now. He touched millions. I therefore was quite shocked to see Russell with Pearl in a local restaurant a few months later, gaunt and frail from cancer. I didn’t quite recognize him. He told me the diagnosis was terminal, and that he was living on tribal remedies and prayer. His face should have been on Mr. Rushmore. The great law of mortality would prevail where the Great White Father had failed, and Russell soon would enter the spirit world. He knew his time on earth was ending, eating eggs in an Ocean Park cafe. My wife, a descendant of the Oglala Nation, and our son, were blessed to know him even briefly. My old friends Bill Zimmerman and Larry Levin were touched enough to fly a plane with supplies into Wounded Knee when the fight was on. Governor Jerry Brown was courageous enough to harbor Russell in California when South Dakota wanted him extradited. Tim Carpenter, now of PDA, was inspired enough in 1971 to march across the United States on the latter-day Trail of Tears. 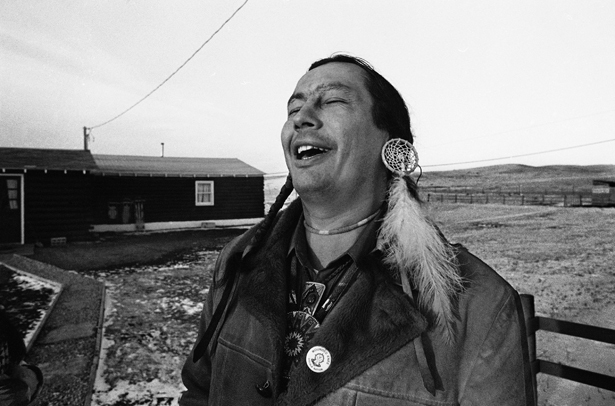 Russell, the imprisoned Leonard Peltier and the American Indian Movement led many to try repealing the past. “No More Broken Treaties” was the slogan of the Indochina Peace Campaign at the time of the Paris Peace Agreement, a reminder of the 371 solemn pacts violated by the US government during the earlier Indian Wars. One of the most momentous violations was that of the 1868 Treaty of Laramie guaranteeing Sioux Nation ownership of the Black Hills, now the center of a vast corporate energy domain. That violation aroused a new generation of native American warriors. The fundamental difference between a truthful, radical interpretation of US history and a merely progressive or liberal one is how deeply one understands that our permanent original sin, even preceding slavery, was a genocide against native people that underlay the the later growth of democratic rights. That truth is what is “buried at Wounded Knee”, what Russell Means’ war for recognition was all about, and why he will be long remembered by my son. Until we in America finally accept and redeem the moral debasement of a Conquest that still underlies the achievement of democracy, our blindness will lead us into one war after another against indigenous tribes and clans in places like Afghanistan, Pakistan, Iraq, Iran, Asia, Africa and Latin America, all stemming from a denial of our own blood-stained origins.